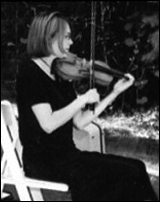 Amy Jones has a Bachelor of Music in Applied Music and Music Theory from the Hartt School, and a Master of Music in Music Theory from the Hartt School. She is a member of the Waterbury Symphony Orchestra, New Britain Symphony Orchestra, Nutmeg Symphony Orchestra and the Wallingford Symphony Orchestra, as well as a freelance violinist/violist and a classical music contractor for Powerstation events. Amy uses a traditional method of instruction with her students.